Retail TouchPoints in-depth study featuring key retail experts offers expertise and predictions as industry heads to NRF show In New York. On the heels of the holiday shopping season and the eve of the National Retail Federation (NRF) Big Show, Retail TouchPoints (RTP), the industry’s go-to source for customer engagement strategies, today unveiled the 2014 Outlook Guide, an insider’s look at the greatest challenges facing retailers in 2014. 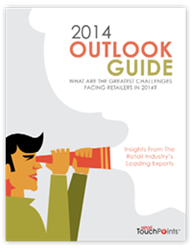 A total of 15 retail industry experts — including well-known analysts, consultants, researchers and retailers — have shared their expertise and predictions for 2014 and beyond. The report also offers reflection on predictions from 2013, with surprising candor and comments related to past, present and future insights. Some key topics include: personalization, social evolution, omnichannel imperatives, payment and the importance of analytics. "Retail TouchPoints is a valuable resource for retailers and solution providers looking to pinpoint the latest information on retail research and trends," said Debbie Hauss, Editor-In-Chief of Retail TouchPoints. "Our readers know they can rely on us for thought leadership and insights that will help move their businesses forward, which is why the 2014 Outlook Guide is a great tool for any type of industry executive — and everyone heading to the NRF Show next week." 1. Social networks exerted a greater influence in brand choice. 2. Consumer expectations would increase (again): Consumer expectations increased 20% . Brands were only able to keep up by 5%. 3. Me-tail: Consumers’ desires for customization and personalization increased: Mass-customization of products and services increased by 48% year over year. Other contributors included executives from: Sole Society, Gartner, Prosper Insight, ForeSee Results, IHL Services and Retail Systems Research (RSR). A closer look at the full report illustrates the experts’ opinions on predictions that may or may not have panned out and how they see these and other issues developing in 2014. In addition to the 2014 Outlook Guide, RTP also has recently unveiled the 2014 Technology Preview, offering an important look at expert predictions specific to the technology sector. 22 key executives from leading solution provider companies share their insights on what to expect with new technologies and trends in the coming year. "The intersection of all channels and touch points is motivating marketers to implement advanced technology solutions in order to engage shoppers more effectively," Hauss continued. "Consumers are more empowered than ever before, and solution partners are helping to reach those shoppers with innovations in mobile technology, in-store solutions, payments and the overall customer experience." During the NRF event, Jan. 12-15, 2014 in New York, industry executives can visit Retail TouchPoints at Booth #204, where RTP will be recording video interviews with top retail companies. NRF attendees and others also can subscribe to the weekly RTP newsletter, currently distributed to more than 28,000 industry executives, at this link: Retail TouchPoints newsletter subscription. For interview opportunities with Debbie Hauss regarding the 2014 Outlook Guide, 2014 Technology Predictions, or NRF 2014 Big Show, please contact Caroline Ferns at caroline(at)gthreecom(dot)com. Retail TouchPoints is an online publishing network for retail executives, with content focused on optimizing the customer experience across all channels. The Retail TouchPoints network is comprised of a weekly newsletter, special reports, web seminars, exclusive benchmark research, an insightful editorial blog, and a content-rich web site featuring daily news updates and multi-media interviews at http://www.retailtouchpoints.com. The Retail TouchPoints team also interacts with social media communities via Facebook, Twitter, Tumblr and LinkedIn.